Original Pilipino music (OPM) has seen a constant stream of new talents as of late. That’s saying a lot about the staying power of our own music scene, regardless of the genre and the generation. Over the last few years, we have seen a steady growth in the number of artists emerging from the underground to the mainstream, coupled with the resurgence of classic local artists and bands (were they really ever gone?). Along with that, music festivals celebrating the breadth and range of our very own musicality is also on the rise. It is the first in BGC Art Center’s plan for an annual music festival that will showcase new and existing talents in the field of OPM. But not just that, as if 102 musical acts is not enough, they also tapped some of the countries renown music personalities like Maestro Ryan Cayabyab, Moy Ortiz, and Noel Ferrer who will curate the six-day music festival. 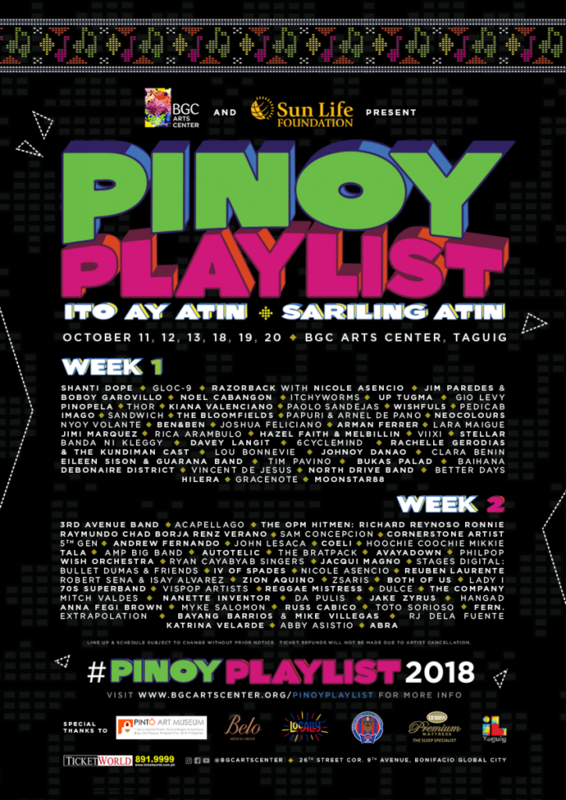 Catch members of the APO Hiking Society Jim Paredes and Buboy Garovillo, Noel Cabangon, Kiana Valenciano, Ben&Ben, Johnoy Danao, Clara Benin, Moonstar88, and more—and that’s just the first weekend happening from Oct. 11-13 at the BGC Arts Center, Taguig. For the second weekend Oct. 18-20, festival-goers will be treated to a day with The OPM Hitmen, Sam Concepcion, Autotelic, Bullet Dumas and Friends, IV of Spades, Jake Zyrus, and Abra, among others. Tickets and festival passes are already up for sale at TicketWorld ranging from P330-P2,250. Don’t miss the Early Bird ticket discounts until Sep. 30.